Monastir, Tunisia — Teenager David Carey will be unleashing all his power when the Alps Tour visits north Africa for the Tunisian Golf Open at El Kantaoui Golf Club's Composite Course today. 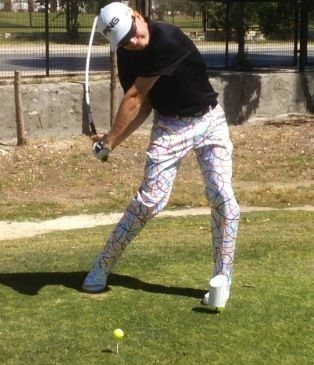 The young Dubliner, who is coached by Noel Fox at the GUI Academy, doesn't like to hold back off the tee. He's also got an 80 percent swing that looks like he's going to burst a gut. But that's nothing until you see his John Daly-like 100 percent effort. Whatever way he swings it, Carey played well when he finished in the Top 10 in two Alps Tour starts as an amateur in Egypt in February and backed up those performances by competing well during the ECCO Tour's winter series at PGA Catalunya. Those performances persuaded him to try the professional game but while playing for cash will be a different prospect (as McCarroll can tell him), if he's as confident on the greens as he is with his power swing, the future could be bright. According to David's father, Dan, security is tight but players being given the VIP treatment and there are lots of tourists about, enjoying the weather, top class accommodation, food and services at bargain basement rates. It's clear, he says, that the local authorities, the golf club and all concerned with the Alps Tour "have all gone to some trouble to make this a special occasion." PGA IRISH REGION — Damien McGrane, Peter Lawrie and Brendan McGovern have signed up for next week's The K Club Newstalk Irish PGA Pro Am in Association with Newbridge Silverware. Ryder Cup hero Paul McGinley helped launch the May 5-6 tournament last week and the interest remains high in what is the most valuable pro am in Ireland with a prize pot of €33,000. Niall Kearney won the inaugural event, which is played over the Palmer Ryder Cup Course and The Smurfit Course. Over 120 amateurs will be battling it out for overall and daily awards and fantastic prizes courtesy of Newbridge Silverware. The owner of The K Club, Dr. Michael Smurfit, has been one of the most ardent and loyal supporters of the PGA in Ireland and is very pleased to be able to host the tournament once more on both courses at the resort. Speaking in advance of the Pro Am, Sharon Smurfit, Director of Golf at The K Club said, “We are really looking forward to welcoming all the Irish PGA professionals along with our members and guests to participate in the event and we look forward to hosting this exciting tournament once again this year. The PGA in Ireland returns to The K Club from May 26-27 when the iconic Ryder Cup venue hosts a two-day pro-am with a prize fund of €33,000 — the biggest on the Irish circuit this year. Damien McGrane showed some European Tour class in winning the Dr William Flynn Memorial Pro-Am at Shannon. Paul McGinley has been so busy since he masterminded Europe's latest Ryder Cup triumph that he's clearly not short of offers of work.